Bio Notes: Frank Charles Mears was born in Tynemouth on 11 July 1880, the son of Dr William Pope Mears who was to become lecturer on anatomy at the University of Edinburgh and Isabella Mears who was sister of John Bartholomew, the Bartholemews having been farmers of Duntarvie on the Hopetoun Estate since the mid 17th century. He was educated at George Watson's College and articled to Hippolyte Jean Blanc from 1896 to 1901. During that period he studied at the School of Applied Art under Frank Worthington Simon and Stewart Henbest Capper, and at Heriot-Watt College. In 1902 he undertook an extended study tour in France and England, the journals of which are in the National Library of Scotland, and he was awarded the Soane Medallion in 1903. In the same year he joined Robert Weir Schultz's office as an assistant and began entering competitions, the drawings for several of which survive in the British Architectural Library. In 1904 he won the Pugin studentship, which he devoted to the manor houses of Somerset, taking an important series of photographs. He returned to Scotland in 1906 as assistant to Ramsay Traquair, but in 1908 he became an assistant to Sir Patrick Geddes on the Survey of Edinburgh for the Town Planning Exhibition of 1910, part of his duties being Secretary of Patrick Geddes's Outlook Tower. Mears commenced practice on his own account in 1910 with an office at 105 Hanover Street, his home address then being Woodburn House in Canaan Lane. He maintained an informal partnership with Geddes and his daughter Norah, born 1887, a landscape architect, their first collaborative work being the Scottish National Zoological Park in 1913-14. The Mears practice then moved to larger premises at 4 Forres Street, but after the outbreak of war intervened, Mears served in France and Belgium as a captain in the Royal Flying Corps with the Kite Balloon Service for which he invented the Mears Parachute. Mears married Norah Geddes in July 1915. From about 1919 he collaborated with Geddes on the architectural aspects of the Hebrew University in Jerusalem, the Einstein Institute and the Wolfson Library being built to Mears's designs by 1926. The project was abandoned in 1929 with the domed Great Hall regrettably unbuilt. It was to have been a Byzantine-influenced design of the Schultz school. In parallel he began teaching architecture at Edinburgh College of Art under John Begg, who had been appointed head of school in 1922 and who, along with Thomas Forbes Maclennan and Charles Denny Carus-Wilson, proposed Mears for Fellowship of the RIBA, to which he was admitted on 29 June 1927. In 1928 the Mears practice moved to 3 Forres Street. Mears then took into partnership Charles Denny Carus-Wilson (born 1886), who came from Sevenoaks. He had studied at the Architectural Association Schools from 1904 to 1905 before being articled to John Belcher in 1906-08, and had travelled in Norway and Sweden and passed the qualifying exam in 1909, being admitted ARIBA on 29 November of the same year. His proposers were Belcher, William Howard Seth-Smith and Hugh Patrick Guarin Maule, all of London. Like Mears, Carus-Wilson taught at Edinburgh College of Art. His partnership with Mears was dissolved in 1934 when the practice became simply F C Mears, architect and moved to 44 Queen Street in 1935. In 1926-27 Mears formed the Association for the Preservation of Rural Scotland and with Leslie Grahame-Thomson he designed a standard rural cottage, 71 of which were built in Roxburghshire. In March 1931 he produced 'The City of Edinburgh: Preliminary Suggestions in Regard to the Development and Replanning of the Central Area'. 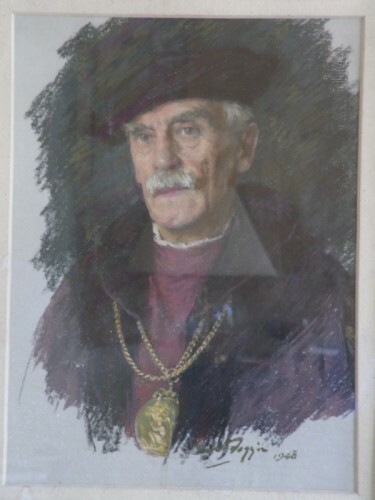 In 1935 he founded the Town Planning Course at Edinburgh College of Art with himself as head of school, and in the same year he had a large hand in the Department of Health's second report on housing in Scotland as a member of its Scottish Architectural Advisory Committee. Town Planning became an increasingly large part of the practice, plans being commissioned for parts of Greenock, Glasgow and Stirling before the Second World War and county plans for Midlothian, East Lothian, Fife, Aberdeenshire and Sutherland after the war. Mears also acted as a consultant on the town planning of Dublin and Kingstown in 1914 and of Jerusalem in 1919, and worked on the general plan for Inverlochy village, near Fort William, in 1927. His plan for Central and South-east Scotland was published in 1949, and a historical essay on Mediaeval town planning was published in the Journal of the Town Planning Institute in November 1923. Mears was elected ARSA in 1936, full academician in 1943 and was its President 1944-50 after an unusually short interval of a single year as academician. The University of Edinburgh conferred an LLD on him in 1945 and in 1946 he was knighted in the New Year's Honours List. His later years were clouded by the death of his third son, Flying Officer John M Mears, killed aged 28 in an air accident at Turnhouse in 1949: their second son Alasdair had died aged 14 of TB in 1932. In 1942 Mears was a member of the Scottish Housing Advisory Committee. He also served on the Scottish Coalfields Committee. In October 1952 Mears and his wife Norah sailed for New Zealand to visit their surviving son, Kenneth, who had a medical practice in Christchurch, the practice being left in the care of his senior assistants, Robert J Naismith and H A Rendel-Govan. He became ill soon after his arrival in New Zealand and died there on 25 January 1953. His home address at that date was Whitehouse, Inveresk. Mears was one of the most influential figures of his generation, known as 'Daddy' to his staff and students. He was a tall military-looking figure of commanding appearance 'old, responsible and avuncular' (George Lawrence) and 'profoundly wise' (Sir Robert Matthew). Robert Naismith and H A Rendel-Govan became partners in the practice after the death of Mears, the practice name then being Sir Frank Mears & Partners and the practice was transferred to 46 Northumberland Street which expanded into no 44 in 1968.